Used tires are everywhere. You see them left on the highway, strips littering the highways. Why not use them for good? What are some recycled rubber ideas? Look at this amazing art work by Yong Ho Ji. I have seen sandals made out of tires. This was definitely an early use of recycling. Vulcanizing and shredding are two great ways to preserve the rubber and reform it into what a consumer might need. This is a quick overview. 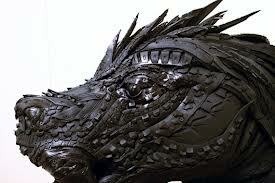 There are many ways to recycle rubber tires. These two different processes explained are quite different. Vulcanizing rubber is a process of heating with high pressure and temperature the rubber to form a new form. This process can form products into shapes and molds. Consistent throughout: because it is vulcanized as a solid product and not held together by binders it does not wear down, curl or buckle. When stress is applied the vulcanized rubber deforms, but upon release of the stress, the article reverts to its original shape. There are 5 different types of this process. Humane Manufacturing use a similar process. The United States Green Building Council’s Leadership in Energy and Environmental Design (LEED) Green Building Rating System classify each product to determine its rating based on the process and the final product. Regupol America, and expert at recycled rubber, recently earned GreenCircle Certification, a third-party certification of sustainable aspects of products and manufacturing operations. next post: What should people consider when choosing barn flooring? 4 Key points.